Protei 006. Open-source sailing drone. Current oil spill skimming technology could only collect 3% of the Oil Spill in the Gulf of Mexico and carried heavy economic costs. The health of workers was exposed to cancerous toxic, the boats could not operate in bad weather (hurricane season), during the nights or far away. Protei 006 is the sixth functional prototype (first real-scaled) of a low-cost open-source oil-collecting robot that autonomously sails upwind pulling a long heavy payload, intercepting oil sheens going downwind. The articulated sailing boat is green, cheap, unsinkable, self-righting, remotely controlled and semi-autonomous: it can run continuously and far away even in hurricane time. It combines conventional technologies in an innovative design that can be implemented in the short term to address timely environmental crisis such as the BP Oil Spill, cleaning the ocean gyre garbage patches, monitoring and mapping radioactivity or performing ocean research. Developed as an open source project, (everybody can use, modify, distribute Protei's design - and share their findings) Protei is constantly evolving and relies on communities and public interactions to grow and thrive. Protei community members learn a lot and make great progress through interacting with people, answering questions, constructive criticism and engaging the world with social / media experiments. This collaboration depends on accessible information and affordable components, as well as the sharing of ideas in an open environment. Protei is made of open-source hardwares and softwares for the control, power and communication — between the vessel and an operator on land, including Arduino, Xbee, and a variety of sensors. Many of the mechanical components and materials are extracted from consumer and industrial products, such as power drills, plumbing equipment and salvaged wood. The entire workflow of Protei is based on an open-source approach. Rather than a hierarchical chain of command, people share their own ideas for each aspect of the project, including planning, budgeting, hardware, software, fabrication, design, and testing. In order to successfully grow into a fleet of DIY drones that can have impact on the oceans, the team documented, distributed and shared information about the mechanical fabrication and electronic architecture. This feeds back into Protei’s success, which depends on ongoing contributions to its design and functionality. The Protei team encourages the use of these materials, and of all materials that we have documented online and elsewhere, for the purposes of furthering the development of Protei as a concept and a technology. We hope that users will document and share any and all progress made using our material. Please make sure to cite Protei by providing a link to our URL, http://protei.org. Protei is one of many Open_Sailing projects, a growing international community with the goal of developing open-source technologies to explore, study, and preserve oceans. 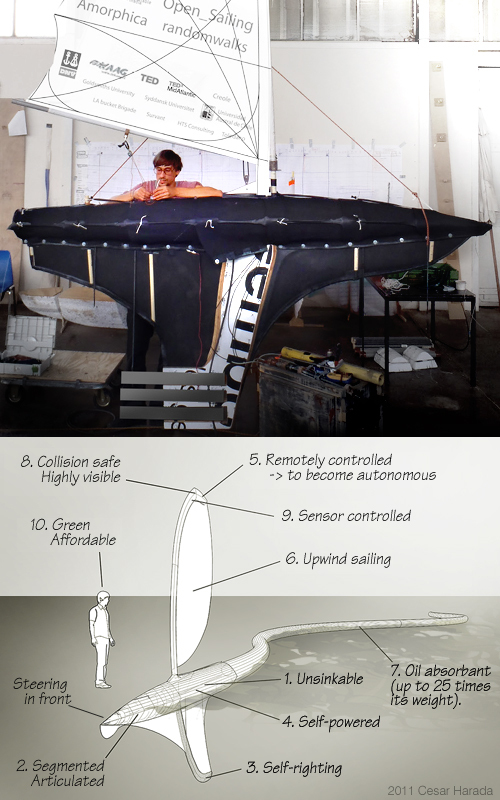 Protei is on Kickstarter (crowd-sourced funding platform for creative projects).